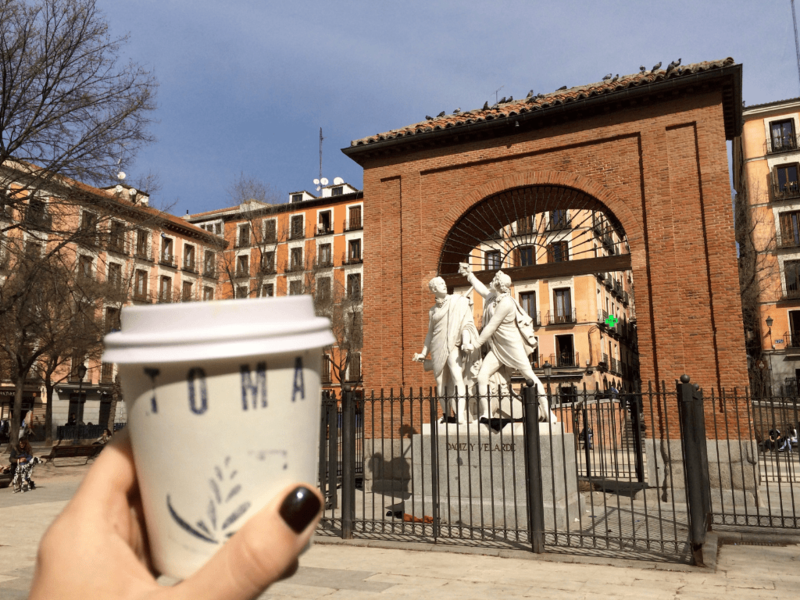 A Complete Madrid Bucket List- What to see, do, eat and more! A few months ago, on my 25th birthday, bedridden with a high fever and bad case of strep, feeling semi-sorry for myself, I made an impulse buy…. 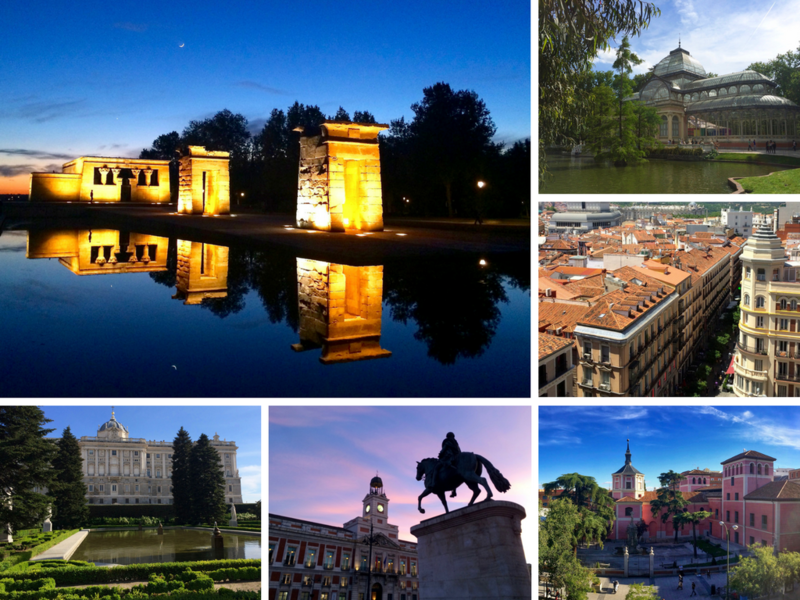 $400 round trip tickets to Madrid… HOW COULD I RESIST?!?! Honestly, I can’t believe it’s already been almost 2 years since I’ve been to Madrid and I couldn’t be more excited to roam my favorite city once more. BUT, with only a week [which is nowhere near enough], I decided to narrow down a list of my absolute must-dos and try to check off as many things as I can possibly bear! I know it’s still a pretty ambitious list to complete in a week, but I don’t know when I’ll be back to my beloved Madrid and I’m determined to take advantage of the little time I have there. 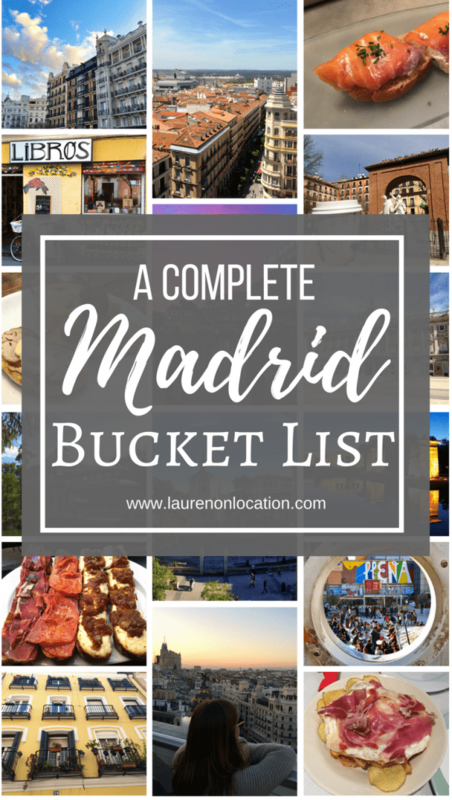 With so many things to do, places to visit and yummies to shove in my face, I mean eat, here’s a list of a few of my favorite things in Madrid! ..”Pan con Tomate” with fresh squeezed OJ for breakfast. This is the ONLY way to start the day in Madrid. Try one of my favorite cafés, Café de la Luz, Bicicleta, Gorila or Toma Café. ..a “Tortilla de Patatas” at Buo. The Tortilla de Patatas at Taberna el Buo may possibly be one of my favorite meals in all of Madrid. It’s plenty to share with friends and you can stuff it will pretty much whatever you want, but I always go for caramelized onions and goat cheese! ..”Churros con Chocolate” at San Gines. Dipping freshly fried churros into warm creamy chocolate at Chocolatería San Gines is a Madrileño classic. There may be a bit of a line, but it’s always worth the wait. ..a “Napolitana” at La Mallorquina. I love the tasty treats at Madrid’s famous pastry shop in Puerta del Sol. ..”Huevos Rotos” at Madrid’s famed Taberna Almendro 13 (or my personal favorite Verbena Bar). Broken eggs over crispy potatoes sprinkled with bacon …. uhm, I’ll take two please. ..a long mid-day “Menu del día.” The best meal-deal in all of Spain is the lunch “menu del día” or price fix. It usually consists of a 3 course meal with drink included and costs less than a normal entrée. One of my favorites is at Momo in Chueca. ..a “Calamari Sandwich” in Madrid’s Plaza Mayor. Although the typical Spanish fried squid sandwich isn’t my favorite (it tends to be a bit on the dry side) it’s still an absolute Madrid must-do. I like to get one to-go at one of the many restaurants lining the plaza, find a good seat and watch the people come and go. ..an assortment of Spanish Tapas alongside a fruity mojito at Lateral. Lateral is one of my favorite places to visit with friends when looking for a classy, yet affordable meal. They have a huge menu with many Spanish classics and something to please every palette. My go-tos are the “Rabo del Toro” (bulls tail), “rollito de salmon con queso crema” (salmon and cream cheese roll) and “morcilla con patata y yema de huevo” (blood sausage with crispy potatoes and egg). ..at the “Oldest Restaurant in the World”- Sobrino del Botín. Restaurante Botín was opened in 1725 and according to the Guinness Book of World Records, is the oldest restaurant in the world! ..as many tapas as possible down Calle Cava Baja. Calle Cava Baja is Madrid’s famous tapas crawling street with one of the highest bars per capita in all of Europe. On a Sunday afternoon, bopping in and out of bars along this road, eating tons of jamón serrano, pimientos de padrón, patatas bravas and “manzanilla” olives is a Madrileño fave. ..some local tapas with the foodie experts of Devour Tours. While in Madrid, there’s no experience more authentic than learning the true art of a “tapeo,” while taking in Spain’s culture of cuisine and meeting the families behind the food! ..a “jarra” of both Mahou (beer) and Tinto de Verano (kind of like Sangria). These are two of my favorite Spanish beverages and a great way to start any night! ..”cañas” that come with free tapas at Petisqueira, Bar Sierra and La Pomarada. Yes, I do plan on hitting all three of these typical little Spanish restaurants! From the outside (and maybe from the inside too) these bars may not look like “anything special,” but they’re about as traditionally Spanish as you can get in Madrid. Nothing better than ordering a few mini-beers and watching the free tapas quickly fill the table! ..as many samples of Spanish wine at Casa Gonzalez as possible. Casa Gonzalez is my favorite wine-bar in Madrid! It’s family owned and has gone through generations of owners! They serve some of the finest Spanish wines there are. ..on as many terraces as possible. Drinking on terraces in quaint little plazas around Madrid, chatting and people watching = my happy place. ..at a rooftop bar. There are SO many rooftop bars with amazing views all over this city. 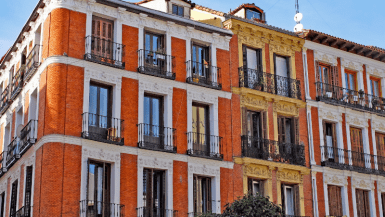 Try a few of my faves: Círculo de Bellas Artes “Tartan Roof,” Terrace at Room Mate Hotel Oscar, Terrace at Hotel de Las Letras, 9th floor of Corte Inglés in Callao and Palacio de Cibeles. ..vermouth at Mercado San Miguel. I’m not a huge fan of Vermouth, but there’s something about drinking it among the stalls of the San Miguel Market that make it all the more tasty. ..wines from Spain’s most famous wine regions. I love making some time for an intimate wine tasting to learn about the Spanish wine scene with a passionate English-speaking wine expert! ..as many sunrises and sunsets as possible. 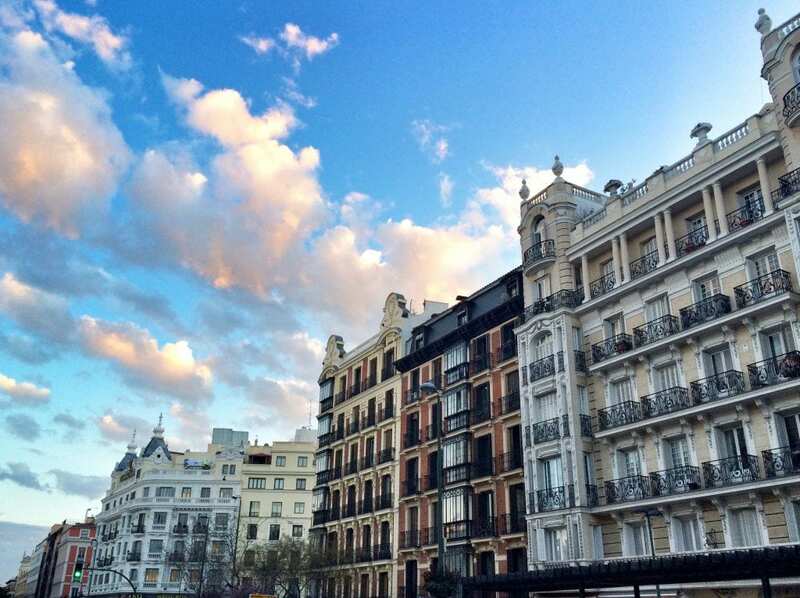 I’m semi-obsessed with the Madrileño sky…. 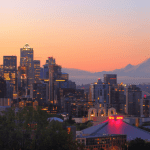 I’ve seen some of the most dramatic sunsets and sunrises from all around this city! ..a sunset at Templo De Debod. If you’re looking for a sure spectacular sunset, head on over to Templo de Debod and stick around until the crowd subsides. The best part is actually about 15-20 minutes after the sun disappears over the horizon. ..Madrid from above at the roof at Circulo Bellas Artes. This is my absolute favorite view of Madrid. I promise it’s worth the small entrance fee! ..a Madrileño fútbol game. With Real Madrid’s reputation and state-of-the-art stadium and Atletico Madrid’s uplifting underdog spirit, you can’t go wrong seeing either team kill the competition on a visit to Madrid. ..the turtles at Puerto de Atocha Train Station. The little mini rainforest swimming with cute little “tortugas” smack in the middle of Madrid’s busy train station is pretty wild! ..Palacio de Cristal, The Royal Palace & Puerta de Alcalá. Some of my must see sights. ..all of my favorite plazas. Puerta del Sol and Plaza Mayor, Plaza de Cibeles, Plaza de Oriente, Plaza de España, Plaza Ventas and the Ventas Bull Ring, Plaza Dos de Mayo, Plaza Tribunal and Plaza del Colon, just to name a few. Pasear. You better believe I’ll be bringing my walking shoes. 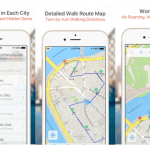 I plan on spanning this city by foot. The center of Madrid is super walkable and I wouldn’t get around any other way. Have a picnic in Retiro Park. I could personally spend an entire day in this luscious open park sun-bathing and snacking with friends. You can also rent bikes to do a quick loop along the greenery or a row-boat to take a spin around the lake. Wander around Malasaña. Malasaña is my favorite neighborhood in Madrid, full of cozy cafés, intriguing boutiques and picturesque pastel buildings. In Puerta del Sol, take a picture with Madrid’s Oso, KM 0 and Tio Pepe. 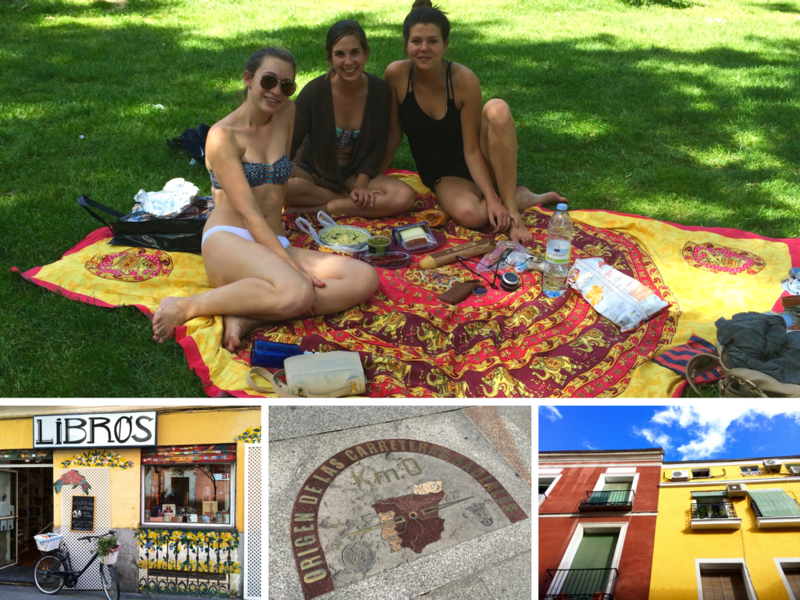 Pretty self explanatory and some of Madrid’s most famous (and most touristy) sights. 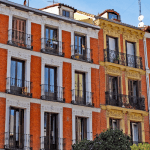 Madrid’s Golden Triangle of Art- The Prado Museum, the Thyssen and the Reina Sofía. I’m not really what you would call a “museum person,” but it’s pretty hard to pass up three of the world’s greatest museums so close to one another. My favorite piece that you can find in Madrid and belongs to the Reina Sofía is the Guernica. Stay out. All. Night. No trip to Spain is complete without fully embracing Spanish nightlife.. Which usually includes walking in the door around 7AM…. ..for fresh produce at a local market. There’s just something about the produce in Madrid! All of the fruits and veggies are somehow brighter, juicier and tastier. I can’t wait to sink my teeth into, well, whatever’s in season! ..down Madrid’s Infamous Gran Vía. Nothing brings me back to the good ol’ days like a stroll down Spain’s famous shopping street Gran Vía, window-shopping and occasionally popping in and out of my favorite Spanish stores, Pull and Bear, Oysho, Bershka and Zara. ..through my favorite thrift stores in Malasaña. I love finding the perfect little previously loved gems on my favorite thrifting street, Calle Velarde. ..in my favorite small local Spanish boutiques. If you’re a follower of my blog, you know I love to shop small and support local when I travel, so I’ll definitely be revisiting some of my favorite Spanish handmade boutiques! 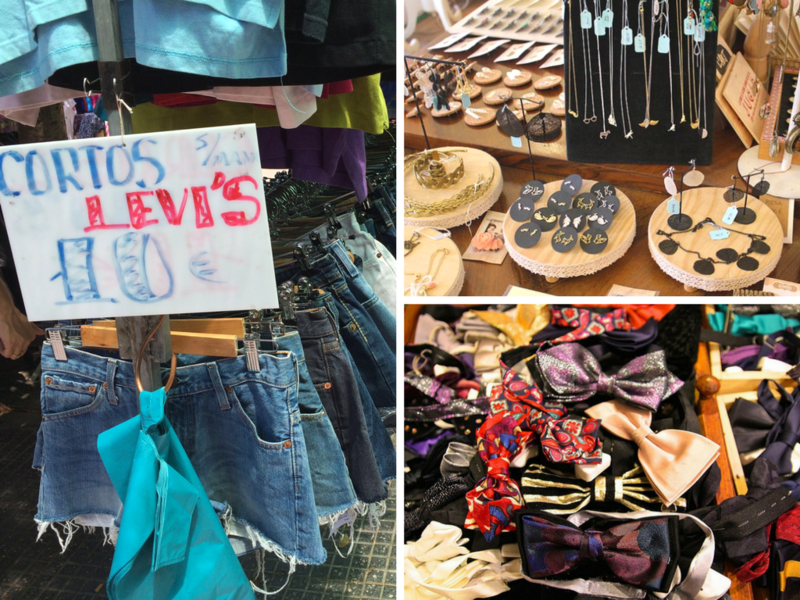 ..for treasures in Madrid’s Sunday flea market, the Rastro. Sundays are by far my favorite days in Madrid, and no Madrileño Sunday is complete without a stroll through the streets of Spain’s famous flea market, the Rastro. Have you ever been to Madrid? What activity above would you like to try? I’d love to hear from you in the comments below! I’ve never been to Madrid but I’ve always wanted to go… Especially now (and not just because of the churros.) I’m definitely adding it to my Places To Visit list! Have fun! Yesss these all sound amazing! I’m glad I checked off at least a few from your expert list in my couple days in the city. I LOVE free tapas – when I was in Cuenca with my friend (who was living there and completely fluent) he took me to all the best places where you’d just order one glass of wine and all of a sudden would have four plates of tapas in front of you! I couldn’t even believe it! I didn’t experience that in Madrid, probably because I was alone, when to touristy places, and can’t speak Spanish aha. Haha well then winter it is! And Madrid’s winters are usually pretty mild, so you’d probably still feel like you were in Spring or fall :P… Just make sure you try some churros next time!! You’ve put together such a great, detailed list! I hope I get a chance to use it and visit this wonderful city. Have a great trip! You had me at churros lol. I saw really cheap tickets to Spain earlier and I was too late on purchasing them! I really want to visit one day SOON! And that sunset picture, so pretty! Haha this is your narrowed down list?! 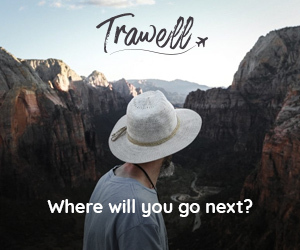 I will definitely be referring to this when I go, you’ve covered everything 🙂 And Iove getting recommendations from other young travellers, particularly someone so passionate about the place. Madrid is such a fun city that changes all the time. This is a great list. Thanks for the opportunity to link up. I did not know “Madrileño” was the word. 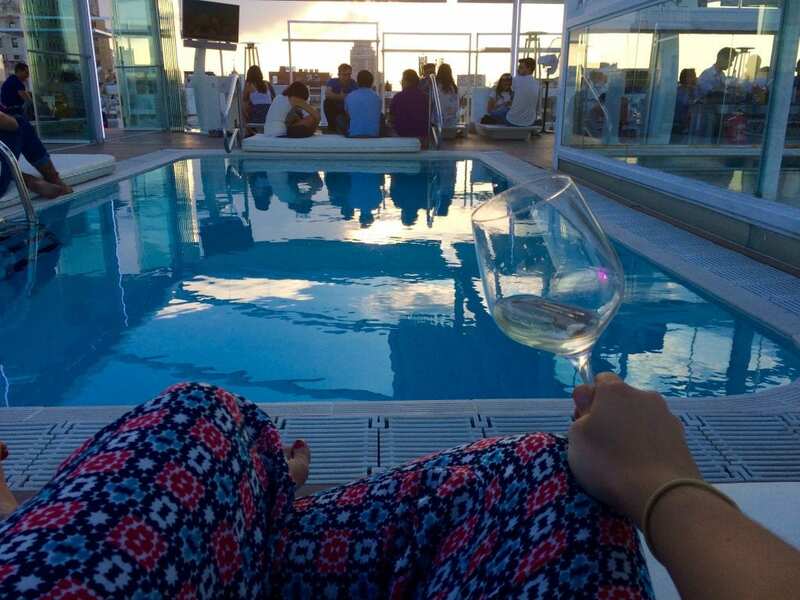 Love to pool bar. That looks so relaxing! Calamari sandwich? I can imagine it being a little dry as you say, but I’d still love to try it! I love calamari! Spain is always a good idea! And Madrid is always so lively and dynamic. 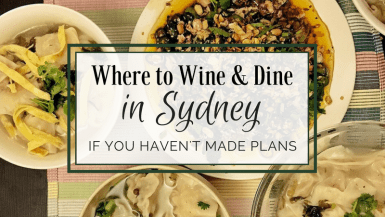 I can’t wait to get back there and try some of your recommendations! 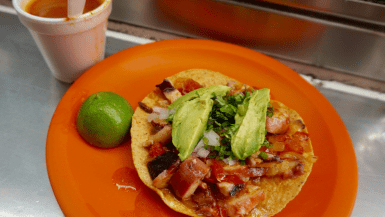 If you’re going to El Rastro, you should grab lunch at El Capricho Extremeño. THE BEST tostas and quite the experience! The line will be long but it moves fast. And make sure you know what you’ll order before you reach the counter so you don’t get yelled at! Enjoy your birthday travel to Madrid! 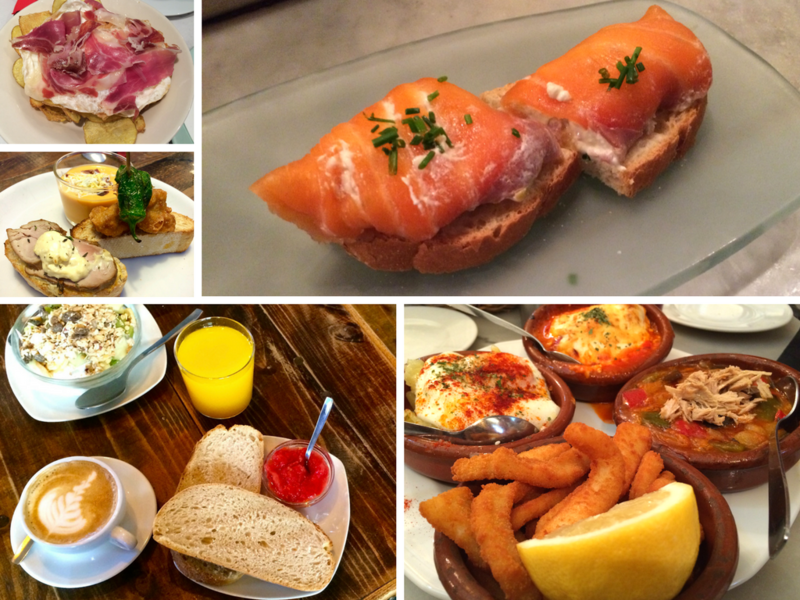 Your post describing the delicious food has made me hungry 🙂 Bookmarking this post, for when I do get to visit Madrid. This city is very charming and is a lovely place to visit. Great photos! I remember the first time Valentin took me tapas crawling in La Latina with his friends…. We got home close to sunrise (a little bit beyond tipsy…. oy) which did NOT please his mom (we stay at his parents home when we come to visit Madrid). I hope you have a fabulous birthday trip to Madrid -and l’m looking forward to your recaps! Oldest restaurant in the world? That sounds pretty cool. I live in Madrid and Templo De Debod is my favorite spot in the city! You definitely had a good to-do list here!! I am going to Spain with my sister at the end of May and we are visiting Barcelona, Madrid, Sevilla and Granada for the first time! Your post is going to be extremely helpful – I can’t wait to try out some of the things you mentioned 🙂 I am wondering what area Madrid you recommend we stay? We will be there for about 4 nights. We are 27 and 30 and definitely looking to go out and explore all day then go out at night.